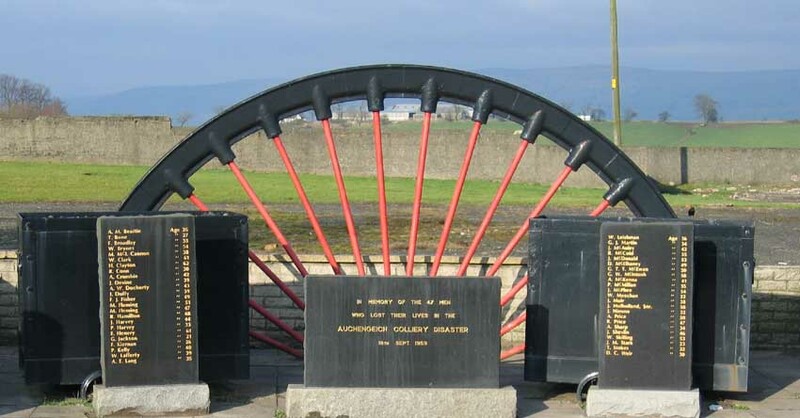 "In memory of the 47 men who lost their lives in the Auchengeich Colliery Disaster 18th Sept 1959"
1. In accordance with the direction given by your predecessor under Section 122 of the Mines and Quarries Act, 1954, I have held a Public Inquiry into the accident which occurred at Auchengeich Colliery on 18th September, 1959, and now have the honour to submit my report. 2. I find that forty-seven men on a man-riding train underground in a return airway died from asphyxia due to poisoning by carbon monoxide contained in smoke from a fire which originated in the driving belt of a booster fan farther inbye and spread to wood props and laggings used as roof supports. 3. I was prevented from inspecting the locus of the fire because the affected area of the pit had been sealed by water to extinguish the fire, but I am satisfied that the evidence given before me at the Inquiry was sufficiently embracing and detailed to enable me to determine the causes and circumstances of the accident. The Ministry of Power, by Dr. H. Hyde, B.Sc., Ph.D., H.M. Divisional Inspector of Mines and Quarries, Scottish Division. The National Coal Board, by Mr. J. O. M. Hunter, Q.C., with Mr. A. J. Mackenzie Stuart, Advocate. The National Union of Mineworkers, by Mr. Abe Moffat, President, Scottish Area, assisted by Mr. J. Wood, Secretary, and Mr. Alec Moffat, Vice-President. The Scottish Colliery Enginemen, Boilermen and Tradesmen's Association, by Mr. D. Kelly, General Secretary. The National Association of Colliery Overmen, Deputies and Shotfirers, by Mr. H. R. Leslie, Q.C., with Mr. W. McIlwraith, Advocate. The National Association of Colliery Managers and the British Association of Colliery Management, by Sir Andrew Bryan, D.Sc., LL.D., F.R.S.E. The Association of Mining Electrical and Mechanical Engineers, by Mr. R. Crawford. 5. Auchengeich Colliery is situated at Chryston in the County of Lanark, some seven miles north-east of Glasgow. It is in the No. 3 (Central West) Area of the National Coal Board's Scottish Division. The colliery manager was J. F. Smellie and there was one under-manager, A. Pettigrew. The Group Manager was C. M. Inglis; the Deputy Area Production Manager (Operations), J. Lawrie; the Area Production Manager, J. R. Cowan; and the Area General Manager, D. Lang. 6. The mine is gassy. It has two shafts, each reaching the No. 2 Pit workings, where the accident occurred, at a depth of 360 yards. The downcast shaft has two hinged gratings, known as "needles", fitted at a depth of about 150 yards, where there is an inset for the No. 1 Pit workings in the Meiklehill Wee Seam, below which cages are not normally wound. 7. At the time of the accident some 830 men were employed at the mine, producing about 730 tons daily. In the No. 2 Pit workings, there were 340 men (about 140 on each of the day and back shifts and 60 on the night shift) and the daily output was about 380 tons from the Meiklehill Main Coal and the Kilsyth Coking Coal Seams. The night shift men ascended between 6.00 and 6.30 a.m., and the day shift men were lowered between 6.30 and 7.00 a.m.
8. Plan No. 1 shows that part of No. 2 Pit workings relevant to the accident. There were two main roads running generally parallel in a southerly direction to the workings in the Main Coal and Coking Coal Seams. The intake airway was used for the haulage of coal in tubs by endless rope and the first 925 yards of the return airway for a man-riding haulage system. Apart from the connections near the pit bottom, there was a crosscut with air separation doors, commonly known as Johnston's Crosscut, some 1,125 yards inbye. Two more crosscuts, each with doors, were provided farther inbye in the vicinity of No. 6 Bench, the branch haulage road leading to the Coking Coal Sections. The return airway from the Coking Coal Sections crossed the main intake airway by an overcast and then joined the main return airway between these connecting crosscuts. The booster fan at which the fie occurred was in the return airway, a little farther outbye. 9. The intake and main haulage road was supported by steel arched girders, twelve feet wide by nine feet high from the pit bottom to Johnston’s Crosscut and twelve feet by eight feet from there to No. 6 Bench. The return and manriding road was steel arched also with timber lagging which had not been fire-proofed. The dimensions of the arches in the return were thirteen feet wide by nine feet high for the first 350 yards or so from the pit bottom, ten feet by eight feet for the next 200 yards, eleven feet by nine feet for another 500 yards to the bend in the road just beyond the inbye terminus of the manriding haulage and, finally, an average of twelve feet by eight feet beyond that point. 10. Intake air ventilating the No. 2 Pit workings split at No. 6 Bench to provide separate intakes to the Main Coal and the Coking Coal Sections. The return air from these sections came together at No. 5 Bench and then passed through the booster fan situated about 40 yards outbye at a point some 570 yards from Johnston’s Crosscut and about a mile from the pit bottom. The exhausting fan at the surface was electrically driven and produced 160,000 cubic feet per minute at 5·4 to 5·5 inches watergauge. A standby fan had a similar capacity. Plan No. 5 shows monthly air measurements taken over the year to August, 1959, at the points indicated. 11. The booster fan, as indicated by sketch plan and elevations in Plan No. 3, was of the double inlet, forward-bladed, centrifugal type with a 45-inch diameter rotor driven by a fiat belt. Reference to the manufacturer's catalogue indicates that this type and size of fan is provided with 64 blades. The fan was not fitted with an evasee. The rotor shaft was carried on two white metal bearings, oil ring lubricated and each with an oil capacity of about six pints. The cambered or " crowned" fan pulley was 22 ½ inches in diameter, 12 inches wide, and overhung the bearing. It was driven at about 540 revolutions per minute by a 100 horse-power, flameproof, slip ring induction motor running at 730 revolutions per minute. The power supply was three-phase, 50-cycle, alternating current at 440 volts. The motor pulley, also "crowned", was 16 ¾ inches in diameter .and 15 inches wide; the pulley centres were 15 feet apart. The fan drive was fenced on the near side with one inch aperture steel wire mesh supported on an angle iron frame secured to a sidewall of the fan house. A timber covering, or "catwalk", made from nine inch by two inch battens was placed over the belt to facilitate access to the nearest fan bearing. 12. The transmission belt was seven-ply and twelve inches wide. It was of a type known as balata belting, made of a folded high tensile cotton duck and balata gum, neither of which is fire-resistant. In the absence of slip the belt speed would have been about 3,200 feet per minute. 13. Plan No. 4 shows the fan in relation to its immediate surroundings. It was situated in a fan house in the main return airway, with the outlet casing mounted in a brick wall built across this roadway and with brick wall fairings to smooth the air flow into the two inlets of the fan. The motor was mounted on three slide rails which afforded a travel of about seven inches for tensioning the belt. The circuit breaker and rotor starter for the motor were in the crosscut adjacent to the motor. A U-tube watergauge and an automatic indicator of the water gauge, situated near a haulage engine towards the intake end of this crosscut, indicated and recorded the ventilation pressure between the intake and the return airways. Three wooden doors in a by-pass roadway were designed to open automatically by change in ventilation pressure in the event of a fan stoppage. 14. The sides of the roadway inbye of the fan to its junction with the by-pass roadway were mainly of brickwork, and the roof was supported by steel girders. Looking outbye from the fan, the left-hand side of the road was a brick wall to the wiremesh safety fence, the position of which is indicated on Plan No. 4. On the right-hand side of the road, for a distance of about 12 feet from the fan, there was a brick wall six feet high on which some short wooden props were set to support roof girders; for the remainder of the distance to the safety fence, upright girders were used to support the roof girders. The girders on roof and sides were lagged with wood; none of the wood had been fire-proofed. 15. The man-riding haulage was an endless under-rope system of modern design in which each car or bogie was attached to the rope by an integral screw clip. The train comprised four bogies, each seating 12 men in three compartments having seats for four, two facing each way. The electrically driven engine, housed in the return airway, was provided with protection against over-running at each end of the haulage and against excessive speed; the position of the bogies throughout the journey was shown on an indicator and, at each end, by a warning stop light. 16. The positions of the water mains, valves, hydrants and other fire-fighting equipment in the vicinity of the booster fan in the return road as described by witnesses are recorded on Plan No. 2. Fire hoses were kept only on the surface. 17. The main telephone switchboard was in the lamp room on the surface, with lines to telephones in the colliery office, the engineer's surface workshop, the winding engine rooms, the pithead and down the shafts. The line from the surface to the upcast pit bottom terminated at a small switchboard, in a pumphouse connected to instruments at Johnston's Crosscut, No. 6 Bench and various other points farther inbye. Conversations between any two points could be overheard on instruments situated elsewhere. There was no telephone communication on the man-riding haulage system. 18. It became apparent quite early in the Inquiry that there was a period of an hour or so during which every minute was potentially significant in considering whether or not, once the fire had started, anything could have been done to avert the loss of life. I was very favourably impressed by the way in which the witnesses, without exception, gave their evidence, but it is nevertheless necessary to keep constantly in mind their difficulty in the timing of events. Very few of the witnesses carried watches and it can be by no means certain that those which were carried were accurate. In these circumstances, it is surprising that the estimated times tie in as well as they do; but it might nevertheless be misleading to place too much reliance upon anyone time quoted. 19. About 6.25 a.m. on Friday, 18th September, 1959, after most of the night shift had gone up and before the day shift had come down, A. Paton, the night shift engineman in charge of the man-riding haulage, was waiting in his engine house near the upcast pit bottom to be relieved by T. Campbell, when he noticed a slight haze and a very slight smell of something burning. He was not perturbed but went to the pit bottom and met the first cage of day shift men just after 6.30 a.m. One of these was J. H. Dickson, the day shift assistant overman; Paton drew Dickson's attention to the haze and smell; Dickson was suffering from a cold and could not smell anything but he sensed signs of " a kind of heat" in the air. He decided to investigate inbye and told an oncost (day-wage) worker to inform R. Boyd, the day shift overman, when he came down the pit. Paton then went back to his engine house and ran the first train down the man-riding haulage road. Many of the men on this train gave evidence about the haze in the pit bottom but, although some sensed that all might not be well inbye, none seemed to have been in any way alarmed. The train left at 6.40 a.m., or perhaps a minute or two before, with Dickson and about seventeen others. The normal journey time was about eight minutes, so it would have arrived at the inbye terminus two or three minutes after 6.45 a.m. There was no appointed guard on this train but it was signalled back to the pit bottom. 20. Some of the men on the train, including Dickson, said that the haze at the in bye terminus of the man-riding haulage was perhaps very slightly thicker than at the pit bottom, but they were still not alarmed. It was the usual practice for some of them to continue to travel along the return airway towards their working places. On this occasion, Dickson decided as a safety precaution that all the men should accompany him through Johnston’s Crosscut into the intake airway and he passed back instructions to that effect. The men followed him into the intake airway, then inbye to the crosscut nearest the fan arriving there at just about 7.00 a.m.
21. Dickson went alone through the doors at the back of No. 5 haulage engine house into the fan house and there found flames rising from the fan belt which had apparently burned through and was lying on the floor with the ends about three feet from the motor pulley. He said that the belt was around the fan pulley and that flame from the belt was being drawn into the fan casing. As I record in more detail later, others who followed Dickson into the fan house saw the fan casing and oil around the bearings burning and, going through the by-pass doors, saw flame coming from the fan outlet into the return airway at or shortly after 7.05 a.m.
22. Meanwhile, the day shift overman, Boyd, who was down the pit by about 6.50 a.m., had received Dickson's message and had gone to the main switches near the downcast shaft with the intention of switching off all the electric current inbye. He was, however, uncertain about the switching arrangements, so he told D. Kirkpatrick, a pump maintenance man, who was conversant with the switchgear, to cut off the current. To make sure that this would not affect No. 1 Pit workings, Boyd decided to telephone to an electrician on the surface. While he was trying to do this he overheard Dickson on the telephone saying that the fan was ablaze. The time would, according to his movements, have been just after 7.00 a.m. In the meantime, J. Thornton, an electrician, had reached the pit bottom and Boyd sent him to the main switches to check that the electric current was off the fan. The electrician went to the switches and then telephoned Dickson asking him to cut off the electricity supply to the fan motor. 23. After he had been to the switches but before he went to the telephone, Boyd had told an oncost worker to give a message to Camp bell in the engine house. The message was overheard by a conveyor beltman, but the precise form it took is a little uncertain; it seems to have been to the effect that no one was to be let down the man-riding haulage until further instructions were given. Boyd said in evidence that he intended that any men in the haulage were to be withdrawn, but that his words possibly did not convey that meaning. He then walked inbye down the intake airway; on the way he met a brusher who had been sent by Dickson to Johnston's Crosscut to stop any men going into the return airway beyond that point. Boyd felt sure he had stopped all men coming in, so he took the brusher in with him to the fan, which he reached shortly before 7.30 a.m.
24. Paton, on receiving the appropriate signal, started to haul the empty train outbye but was then, at about 6.50 a.m., relieved by Campbell. Paton walked to the cage and went up the pit. On the surface he told D. McKinnon, the chief engineer, and A. Pettigrew, the under-manager, that there was a haze in the return airway. 25. Pettigrew suspected that the haze was being caused by the fan belt which as he knew, had given trouble during the night. He went to the lamp room and telephoned a warning to the overman in No. 1 Pit workings that the booster fan might not be working. He had just finished this telephone conversation when a call from Dickson was received in the lamp room. McKinnon spoke to Dickson who said that there was a fire at the fan and that hoses and extinguishers were urgently needed. McKinnon and Pettigrew, after informing the manager, went down the upcast shaft at about 7.10 a.m., taking with them a new fan belt which McKinnon had earlier sent to the pithead. It evidently did not occur to them that there was imminent danger to men in the No. 2 Pit return airway; they were anxious about the ventilation and their sole purpose in mind was to put the fire out and restart the fan. At the bottom of the upcast shaft, Pettigrew and McKinnon encountered fairly dense smoke. Pettigrew saw a number of the day shift men waiting to go up the pit and presumed that they included all the men from the return airway. He went down the intake airway with McKinnon and D. McAuley, a mechanic. 26. The first train returned to the outbye terminus probably a little after 6.55 a.m. Forty-eight men then boarded the bogies to go inbye. This train, according to the engineman, left at 7.00 a.m. or perhaps a few minutes before. The recollection of T. Green, the sole survivor of the men on this train, was that the haze thickened very slightly during the journey to the inbye terminus. With a journey time of eight minutes, the train would have arrived inbye at or shortly after 7.05 a.m. None of the men left the vicinity of the inbye terminus, however, because the arrival of the train there more or less coincided with a thick blanket of smoke which came along the return airway towards them. By common consent, they decided that it was impossible to proceed inbye and they re-boarded the bogies. Campbell received a signal to haul outbye and started to do so; he then received signals to stop and start the train three times in quick succession, but when the train eventually got under way it did not stop again until it was near the outbye terminus. The sequence of signals is borne out in part by evidence of men who were near the engine house. Green, on the other hand, only recollected the train stopping once after it left the inbye terminus; this was at the top of the 1 in 5 gradient when the train was stopped so that one of the passengers who was slumping off a bogie could be pulled back into his seat. This was done and the train signalled away again after a delay which Green put at a few moments. The smoke, according to Green, was very thick indeed; he covered his mouth and nose as best he could with his jacket. He was at the outbye end of the train and when it stopped before it reached the terminus near the engine house, he got off and stumbled outbye until he was overcome just after passing the gate at the outbye end of the man-riding haulage road. As I shall describe later, he 'was rescued. None of the other forty-seven men on the bogies escaped from the return airway. Indeed, as they were found later, it was apparent that forty-three of them had been overcome as they sat on the bogies; one appeared to have fallen from the train about 300 yards inbye; only three seemed to have been able to attempt an escape and they had succumbed quite close to the train. 27. Earlier, as the ingoing train was nearing the inbye terminus, Campbell had received Boyd's message about not letting any more men down the haulage. He construed the message as meaning that his authorised guard and any men who remained on the bogies were to be withdrawn. He was not unduly worried at the time, however, because the haze at the engine house had not appreciably worsened since he had taken over from Paton. When he received the first signal to bring the bogies outbye, Campbell assumed that only the guard was on board; the subsequent signals to stop and start, however, led him to think that something had gone wrong. The train was about half way out when the haze at the engine house turned to thick smoke and he could not see his train position indicator. Conditions became even worse and Campbell, feeling he could not stay there any longer, was faced with the difficult decision whether or not to stop the train. He was still unaware how many men were aboard the bogies and, as conditions became impossible for him, it passed through his mind that he might leave the engine house without stopping the engine. The train would then have continued to the outbye terminus, where the engine would have cut out automatically. He was slowing the engine down when he heard a voice, and he then decided to stop the bogies for fear of running down any men who might be trying to escape on foot. He brought the train to rest about 100 yards from the terminus. By this time, probably just about 7.15 a.m., Campbell himself was almost overcome, but he was able to make his way out through the separation doors near the Main Coal haulage engine to the intake airway, whence he later rode in the downcast shaft to the surface. 28. A number of men were waiting near the outbye terminus for a third train to take them inbye when the haze thickened to smoke. They went into the fresh air which was leaking through the separation doors in a connection a short distance outbye; but while waiting there, they heard sounds indicating that someone was moving. Some of them went back into the smoke and found Green by groping in an atmosphere with visibility at zero. They took him to the upcast shaft bottom whence he was taken to the surface. G. Brown, the onsetter at the upcast shaft bottom, was then also overcome. He was rescued and taken into intake air, then up the downcast shaft. Those who rescued Green and Brown, some of whom took part in· both rescues, acted with undoubted courage and I am glad to associate myself with the tributes paid to them by representatives of all parties at the Inquiry. 29. After discovering the belt ablaze, Dickson stopped the motor, hurried to No. 5 haulage house, a distance of about 50 yards, and picked up a fire extinguisher. He took it to the fire but found it would not work. He thereupon instructed A. Cunningham, a deputy, and others who had followed him to the fan, to try to smother the fire with sand and stone dust while he went to the telephone. He telephoned the surface from No. 6 Bench, about 100 yards from the fan, and asked for extinguishers to be sent down. As officials had been instructed by the manager to notify No. 1 Pit workings if the fan stopped, Dickson also gave a warning that it was not working. He collected another fire extinguisher from No. 6 transformer house but found, on his return to the fan, that this extinguisher also would not work. He did not look for more extinguishers but returned to the telephone at No. 6 Bench and, probably a few moments after 7.05 a.m., made the call in which he asked for extinguishers and hoses. He said that when making one of his telephone calls he had to wait a minute or two before the pumpman who attended to the switchboard at the shaft bottom put his call through to the surface. 30. Dickson went to No. 5 Bench to prepare the hydrant there for the fire hoses but he found the water range blanked off. There was a hydrant some 300 yards away in No. 6 roadway. He thought this too distant and decided to take the hydrant and fix it on the water range at No. 5 Bench. He was assisted in this by others and the hydrant was ready when the hoses arrived from the surface some time later. At about 7.15 a.m. he made a further telephone call to the surface; he spoke to D. Gray, a general duties man, in the lamp room and asked for the Rescue Brigade to be summoned. Up to this time Dickson had seen only the fire inside the fan house. 31. Two deputies, M. Lynch and J. Roe, had walked down the return airway after the first train had left. They had come through Johnston’s Crosscut to the intake airway and arrived at the fan shortly after Dickson. They and others had seen the fan casing and oil from the bearings burning at 7.05 a.m., or perhaps a little later. Roe helped Lynch to put stone dust on the fire for a very short time then, probably just after 7.05 a.m., went through the three by-pass doors. Lynch, who had local fire service experience, tested the extinguishers that had failed when Dickson tried to use them and he, too, found them unworkable. He then followed Roe through the doors. Both men saw flames coming from the fan outlet and striking the roof and the right-hand side of the road between the fan and the safety fence. F. MacDonald, a brusher, said that at 7.15 a.m. the belt had been reduced to ash. The fan casing was alight and when he went through the doors soon afterwards, he saw fire at the roof outbye of the fan. Boyd reached the fan shortly before 7.30 a.m. The fire in the fan itself was still burning but when he went through the doors he saw only smouldering in the roadway between the fan and the safety fence although the return airway was ablaze outbye of the by-pass junction. When Pettigrew went through the three doors a few minutes later, he found fire and a fall of roof at the junction. 32. There is some uncertainty about the time when hoses and other fire-fighting appliances were taken down the pit, but I think it emerges that it was 8.00 a.m. or perhaps a few minutes afterwards. This equipment reached the scene of the fire between 8.20 and 8.30 a.m. and it was quickly put into service by men under the supervision of Pettigrew. At first only one hose was used, but later, by means of equipment brought down by the Rescue Brigade, two more hoses were brought into use. Much later in the morning Pettigrew learned that men were trapped in the return airway and he instructed R. Harvey, the safety officer, to carry out a check of all men in the pit. Harvey did this and then went to the surface where a similar check had been instituted by the manager at about 8.00 a.m. As a result of these checks it became apparent that forty-seven men were missing. 33. Fire-fighting continued throughout the day. For some hours the fire-fighters were able to keep up with the fire, but after a time they were hampered by falls of roof which occurred as the wooden laggings above the girders were burnt away. 34. Soon after Pettigrew and McKinnon went down the pit, Kirkpatrick, the pump maintenance man who had learned of the fire at the fan from Thornton, the electrician at the pit bottom, reached the surface with J. White, a roadman, and began to assemble hoses and extinguishers. The manager, who had been told of the fire by Pettigrew, prepared to go down the pit; he, like Pettigrew and McKinnon, had not appreciated that the lives of men were in danger. On his way to the lamp room, however, between 7.20 and 7.25 a.m., he saw Green being brought out of the pit unconscious and recognised that something was very seriously wrong below ground. The manager realised that it was not safe to use the upcast shaft and immediately gave instructions for winding in it to cease. He told White to inform the engineman of the downcast shaft that the needles were to be lifted at once and then to go down the pit himself and see that the lifting operation was carried out properly and quickly. The firefighting equipment collected by Kirkpatrick and White had meantime been assembled at the downcast pithead awaiting the lifting of the needles. The banksman at this pit, T. Montgomery, put the time at which White descended a little after 7.35 a.m. and said that before 8.00 a.m. the needles had been raised and the rope lengths adjusted (by a drum clutch) to permit winding down to the pit bottom; the manager put this time at 7.55 a.m. which he calculated by reference to his movements following a call he made to the Rescue Brigade. Before telephoning the Rescue Brigade the manager had spoken on the telephone to C. M. Inglis, the Group Manager, and told him of the fire. The manager gave as the reason for this order of priority the fact that access could not be gained to No. 2 Pit workings until the needles in the downcast shaft had been lifted, an operation which would take some 20 minutes. 35. Thereafter, the Area General Manager and other members of area management, B. Spencer, H.M. Senior District Inspector of Mines and Quarries, and L. Cheesbrough, H.M. District Inspector of Mines and Quarries, were informed of the fire and quickly arrived at the colliery. 36. The manager’s telephone call to the Coatbridge Central Rescue Station was received at the Station at 7.40 a.m. The first team left the station ,at 7.45 a.m. and arrived at the colliery, 7 ½ miles away, at 8.00 a.m. The second team followed ten minutes behind. After briefing by the manager, the first Rescue team of five men descended the pit at 8.08 a.m. and immediately set up a fresh air base on the intake side of the pair of separation doors nearest the man-riding haulage. Wearing self contained breathing apparatus they made a preliminary inspection in the return airway and came out to report that the atmosphere was very bad; they had been unable to see anything, but had :stumbled upon a body. The team returned and recovered the body; artificial respiration was given for over half an hour, but without success. In the meantime, the second team went into the return airway but returned within fifteen minutes to report that conditions were no better; when they came out the members of the team were in a distressed condition due mainly to heat. They were unable to determine the temperature, however, because the atmosphere was so dense that they could not take a reading except when close to the separation doors where there was some leakage of fresh air. The reaction bands of palladium sulphite tubes used for carbon monoxide determination became completely black, thus indicating a concentration well in excess of 0.1 per cent. Subsequent analyses of samples collected later by rescue men showed the presence in the return airway of 0.4 per cent. Carbon monoxide, a concentration which, with other effects of fire, would cause death in a minute or two. 37. From about 9.30 a.m. onwards, rescue men made regular examinations a short distance into the return airway near the shafts and took air samples. From time to time the Rescue Superintendent looked into the return airway and decided that conditions were so bad that he was not justified in risking the lives of the members of his teams by asking them to undertake a full scale search. The conclusion had long before been reached, however, that there could be no hope of survival for those who were trapped. Rescue men at the fire worked without breathing apparatus alongside the colliery men, giving advice and valuable assistance generally. 38. When signal bells were heard at about 4.30 p.m. colliery workmen, with rescue brigade men standing-by, started at once to open a way to the return through a stopped-off ‘crosscut (marked “Second crosscut stopped-off” on Plan No. 1); some time later two men broke through into the return, but the atmosphere there was such as to confirm conclusively the view, taken much earlier in the day, that there was no conceivable chance of survival for anyone in it. It was subsequently discovered that the bell signals had been caused by falls of roof fouling the haulage signal pull wire in the return airway. 39. The methane content of the air passing over the fire was continuously and closely watched. The air ·flow was regulated by varying the openings in doorways and by erecting sheets at strategic points. In this way the methane content was kept below two per cent. By 9.00 p.m., the fire-fighters, encouraged by an apparent reduction in the smoke, thought they had the fire under control. At Johnston’s Crosscut, however, the smoke was found still to be very dense and it was realised that, despite their strenuous efforts, the fire-fighters were not overtaking the fire. Some then just before 9.30 p.m., R. J. Evans, H.M. District Inspector of Mines and Quarries, who some three hours earlier had succeeded his Inspectorate colleagues, L. Cheesbrough and F. Tootle, at the fire, noticed that a methanometer was recording two and a half per cent. Of methane just outbye the junction of the two return airways. There were -percentages approaching four and a half at places in the return airway from the Coking Coal Sections and he quite properly advised the withdrawal of all men to the intake airway. By 10.15 p.m. the methane content in places was five per cent. and he informed Dr. Hyde, H.M. Divisional Inspector of Mines and Quarries, who was at the surface. With the agreement of all parties concerned, everyone in the pit was withdrawn to the surface. Hoses, which had been earlier laid in the downcast pit bottom in readiness for such an eventuality, were then brought into use to commence flooding the valleys in the intake and return airways near Johnston’s Crosscut to seal off the fire. 40. The fan was first installed at the colliery in 1946 to balance the available air between the No. 1 Pit workings and the more distant workings in No. 2 Pit without imposing any additional resistance. It was then situated near the bottom of the upcast shaft but, because in that position it caused a great deal of leakage between the intake and return airways, it was moved in 1947 to its present position in the return airway. 41. There were a few occasions when the belt was reported to have been slipping but the fan seems, with two exceptions, to have functioned without any serious trouble until it was speeded up on 20th June, 1959. There was an occasion, put generally at about eight years ago, when two deputies found the fan belt smouldering; their recollections were that they found about three feet of the belt burned through at the motor pulley and that they put out the fire by using two fire extinguishers. On 19th June, Harvey, the safety officer, and J. F. Dickson, who was engaged on general duties at the colliery, saw sparks at the fan outlet. They notified the under-manager and he stopped the fan; M. Barr, a mechanic, went to the fan and found that the thrust collars on the shaft had moved; he adjusted the collars to centralise the fan and left it working satisfactorily. 42. In May, 1959, the manager had decided to examine the possibility of speeding up the fan to improve ventilation generally and to provide additional ventilation in anticipation of development work. Consultations took place between him; the deputy area production managers; the group manager; S. Hogarth, then area ventilation engineer; and J. Smellie, an assistant area mechanical engineer. J. Smellie calculated that the existing fan belt was easily capable of transmitting 120 horse-power and so was ample to transmit the 100 horse-power which he and Hogarth expected the motor would deliver when the fan was speeded up to 540 revolutions per minute. He also calculated that an additional 11,000 cubic feet of air per minute could be expected to pass through the fan. Hogarth calculated that the increase would be 7,000 cubic feet per minute. The makers confirmed by telephone that the fan could safely be run at a speed of 540 revolutions per minute, subject to the reservation that the fan was in sound mechanical condition. Despite the makers reservation, there was no evidence of an attempt to assess the condition of the fan by thorough inspection. 43. On 18th June, J. F. Dickson carried out a ventilation test on the booster fan. He found the motor current to be 85 amperes, corresponding to a motor output of approximately 70 horse-power. He measured the quantity of air passing a point in the return airway 300 feet outbye from the fan as 66,000 cubic feet per minute. The average ventilation pressure developed by the fan was 2·4 inches water gauge measured across the by-pass. The total ventilation pressure due to the combined effect of the booster fan and the surface fan was about 3·25 inches water gauge. 44. On 20th June, the fan was speeded up from 490 to about 540 revolutions per minute. The results of speeding up the fan, as observed by J. F. Dickson on the night of 23rd to 24th June, fell far short of expectations. The quantity of air was increased by only about 4,000 cubic feet per minute and the horsepower transmitted by the motor rose from 70 to 88, instead of to 100. According to ammeter readings quoted by mechanics, the load soon diminished. The current varied between 100 and 105 amperes, corresponding to 80 to 84 horse-power. This result was all to the good from the point of view of belt capacity. Calculations based on the publication” British Standard 2066: 1953, Balata Belting” indicate that a belt made from 33 oz. Cotton duck transmitting 80 horse-power would have had a theoretical capacity margin of about 50 per cent. But, although this was unknown at the time, the belt which caught fire was made from 31 oz. Duck and would have had an excess capacity of about 25 per cent. Experience went to show that the theoretical margins were, in fact, inadequate. A 33 oz. Belt lasted less than ten weeks, a period so short in comparison with the usual life of a belt that it should have raised doubts in the minds of those concerned about the capacity of this belting to carry the load. The British Standard cannot provide guidance on every factor which should be taken into account when assessing the suitability of the belt for a particular duty, and it suggests that certain particulars, including the horsepower to be transmitted, should be sent to the manufacturers. 45. On 11th July, G. Neilson, a deputy, was called to the fan and found the belt off the pulleys and wrapped around the motor pulley shaft; he observed smoke but there was no sign of burning or smouldering. D. O’Connor, a mechanic, put on a new belt the same day. In the course of fitting it he tied a length of half inch diameter hemp rope around the new belt and the fan pulley. He and his fellow mechanics adopted this method of putting belts over pulleys in the absence of a special belt-fitting tool. This belt remained in use until 16th September. Although the mechanics who examined the fan said that it was found to be slipping rather more frequently than the previous belt, they made no adverse criticisms in their reports. On 7th September, the belt had come off the fan pulley and was damaged by contact with the pedestal of the fan, a fastener being pulled out. J. Steel, a workshop mechanic, found the belt was in a very poor condition; he patched it by cutting out a five feet length and inserting two strips, 4 inches and 8 inches wide, respectively, side by side and held together by two belt fasteners. He then took measurements for a new belt, which was prepared in the engineer’s shop on the surface and taken down the pit. 46. On 9th September, Barr, the shift mechanic for whom Steel had substituted on 7th September, inspected the belt and decided that a new one was required; he made a written report to that effect. 47. On 3rd August, the colliery manager had requisitioned an 80-feet length of 12 inch wide, seven-ply balata belting. The requisition was marked “ very urgent” and quoted the name of the last suppliers. The form was sent to the Area Chief Purchasing and Stores Manager who entered on it the reference letters and the number of a contract covering the whole country which, with the approval of the Production Department at National Coal Board Headquarters, had been placed with another manufacturer by the Purchasing and Stores Department. The order was then placed against this contract with the agent of the manufacturer. The 80-feet length of belting was delivered to the local railway station and collected on 7th September. It was placed in the colliery store; there was no evidence that it was stamped with the manufacturer’s name or marked with the British Standard number, as required by British Standard 2066. A length of belting, given variously as 34 feet 6 inches and 35 feet 6 inches, was later cut from it and taken to the colliery workshops where it was prepared for use on the booster fan with bolted plate fasteners to join the free ends. This belt was fitted on 16th September and caught fire two days later. The national contract required that all balata belting supplied to the Board against colliery orders should be in accordance with British Standard No. 2066: 1953, Balata Belting” and, unless otherwise stated in the order, should be made of 33 ½ oz. duck. The Board’s Director of Engineering took steps to satisfy himself that the manufacturers could meet the specification requirement of the contract and afterwards, by sample testing at the manufacturer’s works, to ensure that this was being done. 48. During the day shift on Wednesday, 16th September, when the pit was idle, D. McAuley, the day shift mechanic, was told by Dickson, the assistant overman, to attend to the fan because the belt was slipping. McAuley says that when he went to the fan at about 11.00 a.m. the ammeter was reading 90, some ten amperes below the normal reading. He decided to replace the belt with the new one which was there ready to be put on. Assisted by two pump men, he put on the new belt which was tensioned by moving back the motor. He knew which was the pulley side of the belt and was sure that the belt was put on the correct way. He watched the fan running and in about half-an-hour the belt began to slip. He stopped the motor and cut about six inches out of the belt; to fix the line of the cut he measured six inches along each side of the belt with a rule. He then refitted the belt, tensioned it and re-started the motor. He left the fan running satisfactorily at about 1.45 p.m.
49. Later that day, J. Bell, the back shift overman, visited the fan and found the ammeter reading 65, an indication that there was a great dealt of belt slip. He tried tensioning back the motor but could not tighten the belt sufficiently to stop it slipping. He therefore sent a message to T. Bone, the mechanic on the back shift, to go to the fan. Bone reached the fan at about 4.30 p.m. and, assisted by Bell and two others, cut another length of seven inches out of the belt, using the same method of measuring from the last cut as McAuley. There was at the time an electrical fault in the rotor starter. After an electrician had attended to the fault, the fan was re-started and left running satisfactorily at about 7.00 p.m.
50. On the morning of the following day, Thursday, 17th September, the pit was still idle. Boyd, the day shift overman, told McAuley to visit the fan because the belt was slipping again. When McAuley reached the fan at about 7.45 a.m. he found that the ammeter was reading 60-70 so he cut another length of four inches from the belt. In the course of this adjustment, in which he was assisted by three shotfirers, the fan rotor was pushed out of alignment. When the motor was started, the belt drifted partly off the fan pulley and one of the fasteners was pulled out by contact with the fan pedestal. McAuley trimmed the belt where the fastener had been, re-positioned the fastener and centred the fan rotor. While this work was going on, one of the shotfirers spent some time in applying water to the motor pulley, which was very warm. In the course of running-on the belt, one of the blades of the fan was broken off. McAuley left the fan running satisfactorily at 1.30 p.m. after an electrician had attended to an. Electrical fault in the main switch. McAuley said that when at the outlet side of the fan that morning he noticed that, apart from oil on the blades, there was oil on the apron of the fan and, for a distance of about four feet, on the pavement towards the safety fence and that there were signs of oil on the sides of the airway outbye. He also noticed that there were blades missing in addition to the one which had been torn off that morning. 51. On the evening of 17th September, J. Love, the night shift overman, went down the pit at 10.45 p.m. and arranged the night shift work. He went to the fan at about 1.20 a.m. on Friday, 18th September; he examined it and was satisfied that it was working properly. He recalled that the ammeter was steadily recording 90 and he considered the condition of the fan was normal although McAuley, on the previous day, had regarded a reading of 90 amperes as an indication of belt slip. At 3.40 a.m. Love again visited the fan and found that a part of the ply on the pulley side of the belt had separated and was flapping against the motor end bearing; the ammeter reading had dropped to 60. He telephoned the surface asking for an engineer and an electrician to come down and for the No. 1 Pit overman to be informed that the fan might have to be stopped. He returned to the fan and stopped it. He cut from the belt a three feet length of loose ply (see Plate I), trimmed the ends of the ply left on the belt and re-started the fan. O’Connor, the night shift mechanic, and W. M. Black, an electrician, reached the fan at about 4.15 a.m. They found the ammeter still reading 60 and they stopped the motor. O’Connor examined the belt and found that the balata had exuded from a length of about 12 inches. The belt and the motor pulley were very warm. Love, with O’Connor and another man, cooled these by using about three gallons of water. To tension the belt, O’Connor moved the motor back about three inches and re-started it just after 5.00 a.m. The ammeter reading was then 100. The three watched the fan until about 5.30 a.m., then left it to return to the surface. On the surface, Love met Boyd, told him about the fan and said that a new belt was required. Love then saw the under-manager, told him about the fan’s behaviour during the night and showed him the ply which he had cut off. The time was then about 6.40 a.m. in the meantime, O’Connor had made a written report in which he said the belt was “ ruined” and he told McKinnon that a new one was required immediately. In the two day’s life of the belt, the mechanics were obliged to cut a total of 17 inches from it in an effort to stop it slipping. This unsatisfactory performance seems not to have attracted the urgent attention it warranted. 52. T. Campbell, a gearman (not to be confused with the engineman of the same name) passed the fan at about 6.00 a.m. on his way outbye from work on the night shift. He noticed nothing untoward. There is no evidence of anyone else going near the fan between 5.30 a.m. when Love left it and about 7.00 a.m. when Dickson discovered the fire. 53. After the fire, the Safety in Mines Research Establishment of the Ministry of Power carried out detailed examinations of four samples of belting. The first was the torn ply cut from the fan belt by Love on the morning of the fire. The second was taken from the belt which Pettigrew took underground with him on his way to the fire and which was recovered; this belt had been cut from the same 80-feet length as the belt which caught fire. The third sample was taken from the remains of a length of belting which had been in store for some years and from which the previous belt had been cut. The fourth was from a length of belting supplied after the fire by the manufacturers of the belt which went on fire. These examinations revealed that the belting recovered from underground and the torn ply were both made from 31 oz. duck. There can thus be no doubt that the belt in use on the fan at the time of the fire was made from 31 oz. duck. Tests showed that the 31 oz. belting met the requirements of British Standard 2066 except that under the standard conditions of the tests the elongation of the fabric averaged 13.4 per cent. Against the specified maximum of 12.5 per cent. And adhesion between some plies was poor. The tensile strength satisfied the requirements of the British Standard 2066 for 31 oz. duck. The single torn ply showed signs of slipping but not of burning. The other lengths of belting tested were of 33 oz. duck and complied with British Standard 2066 for that weight of belt. 54. There was in force at the colliery, as required by Regulation 7 (1) of the Coal and Other Mines (Mechanics and Electricians) Regulations, 1956, a scheme of examination and test of all mechanical and electrical apparatus to ensure its maintenance in safe working condition. The scheme incorporated most of the relevant parts of the maintenance system drawn up by Headquarters of the National Coal Board for the guidance of managements, but prescribed only a daily external examination of the booster fan. 55. The daily examinations of the fan prescribed in the manager’s scheme of examination and test were made on working days by one or other of four mechanics who worked at the colliery on a shift rota and were each on the day shift at this pit one week in four. The mechanics recorded the results of their daily examinations on N.C.B. Forms. The reports were usually brief but comprehensive and included a note of any defect observed such as belt slip, and of any remedial action taken. A clerk collected these report sheets every day and passed them to McKinnon who extracted items of importance and entered them into the statutory log book, Mines and Quarries Form No. 267. The log book was signed by McKinnon and countersigned by the manager. Some entries on the N.C.B. Forms were not recorded in Form 267. McKinnon said that he did not consider these entries to be of sufficient importance to warrant inclusion in the book; details of any mechanic’s report were always available in the N.C.B. Forms. 56. An examination of Form 267 disclosed that the initials of mechanics had been entered in the right hand columns of the pages of the book. McKinnon explained that he had made these entries merely to cross-reference each item to the appropriate mechanic’s report sheet. This procedure does not conflict with the guidance on reporting given on the Form. 57. The last entry in Form 267 relating to the fan was dated 19th August, 1959, but McKinnon knew of the trouble with the fan belt on 16th and 17th September. The manager had not seen the reports but was aware of the trouble experienced. Entries in Form 267 must be kept up to date if the book is to serve the purpose for which it was designed. McKinnon’s view as to the selection of items for inclusion in Form 267 was sound enough as a general principle, but any matter apparently material to safety should be entered for the immediate information of the manager and others and thereafter for record purposes. 58. Thorough examination at suitable intervals is the essence of planned maintenance but there was no evidence of internal examination of the fan by a mechanic. W. Love, a young oncost worker, said that he cleaned the fan blades and the inside of the fan casing some time in or about May, 1959. He thought there were” four or maybe five” blades missing, not adjacent to each other but distributed around the fan. He scraped off a total of about half a cubic foot of” dust or damp dust” but he did not recall having seen any excess of oil in or near the fan. 59. It may well be that the men who oiled the bearings of the fan up to that time were sparing in their applications. On the other hand, much more oil than was necessary seems to have been used on some occasions during the six weeks or so before the fire, perhaps for want of instruction of those concerned. An expert witness expressed the opinion that about one pint of oil per week should have sufficed for each bearing if it were in good condition. There was no evidence as to the condition of these bearings, but I am satisfied that surplus oil played a part in propagating this fire. The average velocity of the air in the fan inlet would have been well over 3,000 feet per minute and this would have tended to carry any surplus oil into and through the fan. Over a long period this oil would have mixed with dust carried through the fan and fonned an oily deposit of the nature described by W. Love as “ damp dust”. The minimum amount of oil necessary to spread flame is so small that sufficient could have been present even if reasonable care had always been taken to avoid over-oiling. All practicable steps should be taken to prevent, or at least minimise, the deposition of oily material near a fan outlet. Grease would be better suited than an inflammable oil to lubricate bearings in the special conditions which this accident has shown to exist at booster fans. 60. A report of a thorough examination made after May, 1959, would have disclosed that blades were missing. These should have been replaced because the absence of blades can unbalance a fan to some extent, depending upon the number missing and the relative positions from which they came, and, by setting up additional vibration, can aggravate any tendency of the belt to slip. I do not, however, consider that the missing blades were an important factor in causing this belt to slip. 61. The fan was not in a deputy’s district but, because it played an essential part in the ventilation of the gassy coal winning districts, the deputies took it upon themselves to visit the fan from time to time to assure themselves that it was working properly. It was only 170 yards from their meeting station and anybody travelling outbye in the return airway to the man-riding haulage would have passed it. This airway had not been inspected and reported upon daily since June, 1959. Regulations required that it should have been inspected and reported upon, but I am satisfied that it was in good condition and that the omission had no bearing on the accident. 62. There is some evidence that when the fan was first installed it was constantly attended on all shifts; afterwards, for some years up until July, 1959, there was regular attendance but only on a part-time basis. Three men, one on each shift, looked after the fan as well as running the haulage at No. 5 on the day and back shifts and undertaking pumping duties on the night shift. These three men retired in July, 1959. On 3rd August, J. Clarke became the day shift haulage man at No. 5. He was authorised in writing to operate electrical switchgear and to oil, examine and report on the fan; the under manager gave him some instructions about his duties on the fan but these did not include an instruction to inspect the fan every half-hour; I am very doubtful whether he could have complied with such an instruction because it would have been incompatible with his haulage duties. Clarke attended to the fan three times during his shift. He did not examine the fan nor did he report on it. The attention he gave it seems to have been limited to seeing that the fan was running and to oiling it. He said that the quantity of oil he used was about two pints during his shift, one pint at the beginning of the shift, half a pint in the middle and another half a pint at the end. P. Keenan was the new haulage man on the back shift; he said that he had received a general instruction from the back shift overman, Bell, to look at the fan from time to time and report to him if he found anything wrong. Keenan was not otherwise authorised to look after the fan but he said that he oiled it occasionally. There was no regular arrangement for looking after the fan during the night shift. On the night before the fire the manager instructed the night shift overman, Love, through the safety officer, Harvey, to put a man on the fan for that night. The overman said that the instruction he received was to the effect that he was to pay attention to the fan and notify the overman in No. 1 Pit workings if it stopped. There was unusually high absenteeism on the night shift and the overman accepted personal responsibility for looking after the fan. 63. Regulations 18 and 19 of the Coal and Other Mines (Ventilation) Regulations, 1956, prescribe certain requirements in regard to the equipment and supervision of the fan. The equipment required by Regulation 18 - a water gauge and an automatic indicator registering the ventilation pressure was properly provided but it is clear that the provisions of Regulation 19 were not observed. Regulation 19, which requires, as a minimum, inspection at half hourly intervals, may have been designed primarily to provide against danger from inadequate ventilation in the event of a fan stopping or slowing down but this accident has demonstrated the importance it can assume in regard to fire risks at underground booster fans. The speed with which fire at a fan can develop, as shown by this accident, points to the need for something more than half-hourly inspections. I have in mind such precautions as the fitting of automatic devices to give audible alarm at a place constantly attended in the event of over-heating and automatically operated fire-fighting devices, such as water sprinklers or curtains, especially on the downwind side. These are matters which call for careful consideration of all the circumstances at any colliery where there is an underground fan which presents a fire hazard. 64. As no one can say precisely when the fire started or how it developed, it follows that it is not possible to judge with certainty whether or not half-hourly examinations in this period of time would have affected the outcome of the accident. But I cannot discount the possibility, to put it no higher, that a half-hourly inspection may have disclosed a developing danger in time to afford an opportunity of averting the tragic result. 65. It was suggested at the Inquiry that even had fan attendants been appointed there might have been an interval of more than half an hour due to the change of shifts. I cannot accept the implication that the provisions of Regulation 19 are confined to shifts. I was glad to learn at the Inquiry that, as an immediate measure, the National Coal Board had instituted a system of constant supervision of all underground fans driven by balata transmission belts pending substitution by safer drives. 66. In the light of subsequent knowledge it is difficult to understand why the the haze observed at the pit bottom,· and also inbye by the men on the first train, was not recognised as a symptom of an outbreak of fire. But it was not so recognised by anybody. It had no effect on the eyes, or on breathing and, although some of the men mentioned a smell, this was not sufficiently distinctive to be identified. Many of the men who saw the haze were experienced underground workers, but none was alarmed in any way. 67. Dickson went down the return airway with about seventeen other men and I cannot believe that he was so reckless of his own and other lives as to have disregarded imminent danger had he sensed it. When he reached Johnston’s Crosscut conditions were, he considered, slightly worse and he took all the men with him into the intake airway. He seems to have had in mind that the haze might get thicker if he approached its source from the return side. He was doubtless anxious to keep the men with him so that they would not lose touch and so that he would have assistance if he needed it when he reached the source of the haze. It is apparent that he did not expect any worsening of the atmospheric conditions in the return airway outbye of Johnston’s Crosscut. Had he done so, he could have telephoned from Johnston’s Crosscut to the shaft bottom to stop any more men con ling inbye. When he found the fan stopped and the belt on fire he lost no time in advising the surface by telephone both of the fire and of the risk to the men in No. 1 Pit workings. He overlooked the possibility that the fire might endanger men on the return side in No. 2 Pit workings. It must be remembered, however, that all he had seen was the burning belt which was probably producing comparatively little smoke. If the fire had already spread outbye to burn timbers and produce the thick smoke which overcame the men on the second train, he was not aware of it. Nothing he could have done at that point in time would have prevented the second train starting inbye. In my reconstruction of these important events, dense smoke was already being given off by burning wood and the train was half-way to the in bye terminus. 68. There had been no apparent change in conditions at the pit bottom when the second train went inbye at or shortly before 7.00 a.m. The second train had amongst its forty-eight passengers a number of experienced men, including a deputy and eight shotfirers. But these men, like those on the earlier train, cannot have suspected danger. Green, the sole survivor, said that the train went off in the usual way and that the journey inbye was uneventful. 69. The day shift overman, Boyd, seems to have recognised when he came down the pit at about 6.50 a.m. that the haze was a symptom of some trouble inbye. Though he thought about machinery, it is evident that he had no thought of immediate danger. When, just after 7.00 a.m., he overheard on the telephone Dickson’s message to the surface that the fan was on fire, he at once set off inbye to join Dickson at the fan. With positive information about a fire inbye he should immediately have taken effective steps to ensure that any men on the return side were withdrawn and that no others entered the return airway or the upcast shaft. At that time, however, no instruction to withdraw could have saved the unfortunate men on the train. 70. The under-manager did not take any steps to see that all men were withdrawn into an intake airway when he went down the upcast shaft at about 7.10a.m. and found thick smoke. It would have been far too late for anything to have been done to save the men on the train but there were other men in the upcast pit bottom and they should not have been allowed to stay there. 71. I am satisfied that these officials conceived it to be their duty to get to the fire as quickly as possible, and to deal with it safely and expeditiously. Their reaction to the situation, however, is an example of an unfortunate tendency on the part of persons faced with an emergency to concentrate their attention on removing the cause of danger rather than first safeguarding against its possible effects. This makes it necessary for me to emphasize the vital importance of officials recognising that anything in the nature of smoke underground, however faint it may be, constitutes a potential danger to life, which must be met by the immediate withdrawal to a place of safety of all persons except those necessary to combat the danger, and by effective steps to prevent other persons entering the danger zone. 72. Section 79 of the Mines and Quarries Act, 1954, imposes upon the person in charge of a part of a mine the duty of withdrawing workpeople who may be endangered if it appears to him that a danger exists. Regulation 11 (1) of the Coal and Other Mines (Fire and Rescue) Regulations, 1956, deals specifically with danger from fire and refers to smoke or other signs indicating that a fire has or may have broken out. 73. Several witnesses of the fire in its early stages at the fan saw that the belt was lying on the ground below its normal position on the pulleys. The belt had burned through at the motor pulley and most of the belt was in flames. Dickson, who first saw the fire, thought that the belt was then on the fan pulley; Roe and Lynch were not sure of this. After the fire had passed beyond the fan house an inspection of the motor pulley disclosed that the face of it was blue in colour; the fan bearings remained free enough to allow the pulley to be turned easily by hand. 74. The raw materials used in the manufacture of balata belting were known to be readily inflammable. An investigation was carried out at the Safety in Mines Research Establishment at Buxton to examine and demonstrate to interested parties the degree of the fire hazard that may arise on balata belt drives. An experimental layout was assembled to simulate as far as possible the drive of the booster fan. The diameters of pulleys, the distance between their centres and the speed of drive were similar, but the belt was six inches wide and driven by a 50 horse-power motor. The driven shaft was coupled to a dynamometer, by means of which different loads could be applied to the drive. Tests were carried out with: (a) a belt slipping on a pulley; (b) a running belt with one edge rubbing against a stationary object; and (c) a belt stalled and remaining in contact with the rotating driving pulley. Photographs taken during the investigation are reproduced in Plates 11 and Ill.
75. In belt slipping tests, the temperature of the pulley on which slipping occurred rose to, but not beyond, 1100 centigrade; the belt became warm and stretched from one to two per cent. In the first few hours. With a state of continuous slipping established, the load dropped to a comparatively low value and any attempt to increase it tended to throw the belt off the pulleys. Various means, including the provision of guide rollers, were then adopted to keep a continuously slipping belt on the pulleys; in these conditions the temperature of the pulley on which slipping occurred rose only to a maximum of 1300 centigrade. 76. In experiments in which the edge of a belt rubbed against a stationary object, on only one occasion, when an asbestos cement sheet was used, did smouldering develop to such an extent that the belt finally broke. Rubbing against a brick wall did not produce smouldering. 77. When a stalled belt was only partly on the motor pulley it began to smoulder after thirteen minutes and finally broke seven minutes later. The ends fell on the floor and burst into flames after being exposed to a current of air. When a stalled belt was completely on the pulley, white fumes appeared in four minutes; smouldering began after nineteen minutes; the belt finally broke after 26 minutes and later burst into flames when a current of air was passed over it. The temperature of the motor pulley rose to 2600 centigrade and the face of the pulley became blue. 78. From this investigation it seems reasonable to deduce that a running balata belt is unlikely to develop dangerous heating so long as it stays on the pulleys and does not rub against a stationary object. If rubbing occurs, smouldering may possibly develop on the rubbing edge. But there is no doubt at all that a serious fire hazard arises when a balata belt stalls completely and remains on a rotating pulley; providing the tension of the belt is high enough it will smoulder and burst into flames in a current of air. 79. F. J. Hartwell, a Senior Principal Scientific Officer of the Safety in Mines Research Establishment, in relating the results of the investigation to the circumstances of the fire, expressed the view that, when the belt on the fan stalled and started to smoulder and then caught fire near the motor pulley, the large quantity of air available would have diluted the smoke and carbon monoxide produced and accounted for the haze which was seen in the pit on the morning of the fire. He suggested that the flames from the burning belt might have ignited oil in the fan and in its vicinity and that this burning oil could well have produced the flame which witnesses saw issuing from the fan outlet. The flame would have been bunsen-like and the smoke would not have been very dense. Such a flame could then have rapidly ignited the wood outbye the fan and produced heavy smoke and carbon monoxide in dangerous quantities. 81. Hartwell thought it unlikely that incandescent fibres blown through the fan into the return airway could alone have caused the timber to catch fire. In his opinion the build up of the fire would not have been sufficiently rapid to account for the suddenness with which dense smoke appeared in the return airway farther outbye. The essential difference between the two theories is that Hartwell’s relies upon the presence of combustible material in the fan and Lang’s does not. Hartwell’s theory is better supported by the evidence but both reconstructions emphasize that only fire-proof materials should be used in the construction and fittings of a fan house and of the roadway for safe distances on both sides of a fan. 82. No one can say with certainty how the fire started and then developed but considering the evidence, including the results of the experiments made at the Safety in Mines Research Establishment, I visualise the course of events to have been generally as follows. 83. When Love, O’Connor and Black left the fan at about 5.30 a.m. on the morning of the fire, the power transmission belt had become soft in parts and the balata had exuded to some extent. It had been further weakened by the cutting out of one ply over a length of about three feet and the leading loose end of this ply would have had a tendency to ruck at the pulleys, thereby encouraging the belt to wander across them. Then, as had happened at least once before on this fan, the belt came off the fan pulley and jammed near it. The belt was stalled on the motor pulley and, there being sufficient tension to provide frictional resistance, the belt quickly heated up to the stages of smouldering and, eventually, flame. This reconstruction of what happened is not supported by the evidence of Dickson, whose recollection was that the belt was still on the fan pulley when he arrived. It must be remembered, however, that his attention was then, quite properly, concentrated on extinguishing the burning belt and not on establishing the cause of the fire. Moreover, the wire mesh fence was between him and the fan pulley and he may easily have been mistaken. As I have said, the Safety in Mines Research Establishment failed to ignite a belt which was slipping but not stalled. 84. It is possible that the belt was insufficiently and unevenly tensioned when first fitted, a condition which can lead to slip, over-heating and ply separation. Although there was no evidence that the belt was not cut at right angles, the method used to mark the cut can lead to inaccurate results, if only by perpetuating uneven stretch, and to uneven tension. The belt lost tension far more than is usual. McAuley cut six inches from it within half an hour of first starting up, and in two days before the fire a total length of 17 inches was cut out. 85. If the belt did, as I think, stall and become ignited by the revolving motor pulley, it would. Not have been long before it burned through and fell to the floor. The ends would have continued to burn towards the fan pulley. The fan must have been stationary for Some time before flame reached the inlet on the pulley side, but the exhausting fan on the surface would have continued to induce a brisk current of air through the booster fan even though the by-pass doors would have opened when it stopped. The air-flow pattern of the flames and the hot products of combustion would have resulted in the vaporisation and ignition of the lubricating oil used in the fan shaft bearings and of oily deposits on the surfaces of the fan casing and runner. Flame issuing from the fan outlet would have been projected against and ignited similar deposits on the roof and upper part of the sides of the roadway near the fan and set alight the short wooden props and laggings. Thereafter the fire would have spread very quickly to other props and laggings outbye. 86. There were thus three stages of combustion, probably overlapping each other to some extent: (a) the belt; (b) oil from the bearings and oily dust in and around the fan; and (c) the wood props and laggings in the airway. The first two stages produced fumes and smoke which, being diluted, caused the haze in the return airway; the third stage produced dense smoke and carbon monoxide in dangerous quantities. 87. In attempting to estimate the time at which the fire started it is necessary to work back from the time when Paton first noticed the haze at his haulage engine. The quantity of air which passed in the return airway when the booster fan stopped was given in evidence as 50,000 cubic feet a minute and this can be confirmed by calculation. It can also be calculated that the velocity of this air current would have carried the haze from the fan to the man-riding engine house in less than nine minutes. Thus the haze ‘which Paton first saw at about 6.25 a.m. would have been produced at the fan shortly after 6.15 a.m. and I take this to be the time when the fan belt started to heat up to the point where it gave off fumes. If the experiments by the Safety in Mines Research Establishment are taken as a guide, the belt probably stalled shortly after 6.00 a.m. When Campbell passed the fan on his way outbye. It may conceivably have been later by five or ten minutes as the belt had already been seriously impaired and both the belt and the pulleys would have been warm to begin with. 88. The time the fire took to spread from the belt to the timber in the roadway is largely a matter of conjecture, but I estimate that the belt commenced to smoulder about forty-five minutes before the wood outbye the fan was burning sufficiently to generate dense smoke. I form this opinion by deduction from Green’s statement that thick smoke met the second train as it reached the inbye terminus at 7.05 a.m. or perhaps a minute or two later. The smoke would have taken about four minutes to reach this point from the fan so I conclude that the timber in the roadway outbye the fan was well alight soon after 7.00 a.m. Thus the fire was almost certainly spreading outbye of the fan by the time Dickson reached the fan house. The smoke which enveloped the second train at the inbye terminus would certainly have persisted and possibly thickened during the fatal journey outbye because the smoke was travelling quicker than the train. 89. There was a delay of at least 20 minutes in calling for the services of the Central Rescue Station. It is true that if the call had been made immediately after the fire was discovered the rescue teams could not have saved life in this instance, but this does not detract from the general principle that as soon as anyone in charge of a mine or part of a mine has reason to suppose that an emergency has occurred he should forthwith summon rescue men. No harm is caused if events prove a call to have been unnecessary. 90. The final decision to withdraw everyone from the pit was taken with the approval of all parties when the quantity of methane passing over the fire was approaching explosive proportions. There was no alternative because of the risk of explosion. The only way left to extinguish the fire was to deny it a supply of air and this was done by applying water seals to intake and return airways in the valley near Johnston’s Crosscut. By 24th September the bodies of the forty-seven victims had been recovered from the positions indicated on Plan No. 1. 91. The medical evidence is to the effect that all the victims of the accident died from asphyxia due to carbon monoxide poisoning, possibly associated with a lack of oxygen, and that death would have occurred rapidly. The dense smoke met the man-riding train at the inbye terminus and I conclude that the victims must have been overcome by poisonous fumes during the journey outbye and that the were dead by the time the bogies stopped or died a minute or two later. 92. The outcome of this accident might well have been less tragic if the men had carried and used self-rescue apparatus. Sir Andrew Bryan, then HM. Chief Inspector of Mines, included in his Report on the underground fire in 1950 at Cresswell Colliery (Cmd.8574) a recommendation that underground trials of improved forms of self-rescue apparatus should be expedited. Extensive trials were carried out over a long period under the auspices of the industry’s consultative machinery but, after very careful consideration of the results, all parties agreed to discontinue the trials. In view of the circumstances in which the men at Auchengeich Colliery met their death, I recommend that the whole question should again be reviewed by the industry. 93. The first line of attack on the fire failed when the two extinguishers which Dickson tried to use did not function. Some sand and stone dust was used but extinguishers might have served much better to extinguish the belt fire; two extinguishers quickly put out a smouldering belt at the same fan eight years before. If, however, this fire had, as I think, already extended beyond the belt, two extinguishers would not have had any worthwhile effect upon it. 94. There was no means of fighting the fire in the airway until hoses were brought from the surface and these did not arrive until between 8.20 and 8.30 a.m. In the interval of nearly one and half hours between the discovery of the fire and the application of water, the fire had taken a substantial hold on the timber in the return airway and the fire-fighters were faced with a task which proved to be impossible. But the smoke which killed the forty-seven men in the return airway was, I think, issuing from the fire before it would have been possible to bring a hose into use even had there been one readily available and the hydrant at No. 5 Bench been in working order. In other circumstances, however, reduction in the delay in starting effective fire-fighting might have made a great difference. 95. Colliery officials said that fire extinguishers underground had been tampered with on frequent occasions and this was suggested as a reason why the two extinguishers failed to function. The officials also said that some years ago brass fittings had been removed from hoses kept underground. The management put forward the view that, much as the absence of hoses below ground was to be regretted, it was better to have hoses intact on the surface and accept the delay in getting them below ground when required, than to have hoses in the pit and find them useless in an emergency. I cannot accept that these were the only alternatives. There was a special reason against keeping all the fire hoses on the surface in that none could be lowered to the downcast pit bottom until. The needles had been raised. The malpractices to which reference was made cannot be too strongly condemned, but the management were not by reason of them absolved froln their obligations under the Coal and Other Mines (Fire and Rescue) Regulations, 1956. According to witnesses the subject came before the Pit Consultative Committee but the discussions were not minuted. Any discussion in a Pit Committee on a subject so vital to safety as the maintenance of fire-fighting equipment should be properly recorded and vigorously followed up, both by the management and by the representatives of the workers. 96. Any fire below ground is potentially a very serious matter. In the case of a fan particularly, the high velocity of the air current tends to assist a rapid spread of flame. Booster fans, which must constitute a fire risk, should therefore not be used if adequate ventilation can be provided by any other means. 97. Where booster fans are unavoidably used, the management should take every possible step to reduce the risk of fire and to ensure that if fire breaks out it is suppressed with the minimum of delay. The use of belts which are not fire-resistant should be eliminated. Inflammable oil as a lubricant should also be eliminated; until this has been done, any surplus oil in the neighbourhood of a fan should be carefully removed. The roadway for a suitable distance, particularly on the downwind side, should be completely fire-proof. There should be in readiness sufficient fire-fighting equipment in working order for immediate use and the man in charge of the fan should know how to use the equipment. Consideration should be given to the need for additional safeguards such as automatic devices for giving audible warning of over-heating and specially provided water sprinklers or curtains on the downwind side. 98. In some circumstances a forcing fan on the surface constitutes a similar danger and the recommendations I have made should be applied to forcing fans above ground wherever necessary. 99. A major advance in reducing the risk of fire underground stemmed from the Creswell Colliery disaster. Fire resistant conveyor belting was developed and is now in general use. Power transmission belting presented different problems but the knowledge gained helped the development of fire resistant V-belts. In 1955, the National Coal Board issued an instruction that only fire resistant V-belts were to be used underground. The instruction was later extended to V-belts used anywhere at a colliery to prevent the possibility of belts intended for use on the surface being sent below ground. Fire resistant flat belting is now being developed and I am satisfied that it will not be long before there is available a type satisfactory in all respects. Power transmission belts used on any underground machinery should be made of fire resistant material as soon as satisfactory belting becomes available. Thereafter, no other material should be supplied for use above or below ground. In the meantime, managers of mines should make effective arrangements to ensure that any over-heating or fire in machinery driven by an inflammable belt will be discovered before danger can develop. I was glad to hear at the Inquiry that the tendency will probably be towards the elimination of flat transmission belts underground. 100. Another point dealt with in the Report on the fire at Creswell Colliery calls for mention here. The suggestion was made that where man-riding by rope-haulage takes place in return airways, arrangements should be made, where practicable, to ventilate the haulage engine house by intake air. The Auchengeich Colliery fire emphasizes the desirability of this, since the haulage engineman was compelled by the smoke entering his engine house in the return airway to leave his engine before the train on which the men were riding had reached the outbye terminus. This situation is better avoided, although it seems unlikely to have had any bearing on the accident. 101. Telephone communications at Auchengeich Colliery could perhaps have been improved upon in two respects. Dickson encountered a slight delay when making a call to the surface because it had to go through a switchboard at the pumphouse in the downcast pit bottom. Additionally, there was no means of telephonic communication on the man-riding haulage road. The outcome of the fire was not thereby affected but I recommend for consideration that all telephones at a colliery should be connected directly to one surface exchange, constantly manned and preferably located with the General Post Office telephone. Wherever men ride in trains worked by rope haulage, I think there would be advantages in having two-way communication between the driver and the guard over the whole length of the roadway. 102. The fire at Auchengeich Colliery started at a booster fan, that at Creswell Colliery in a conveyor installation. Before these accidents neither of these classes of plant had been regarded as particularly serious potential source of fire. Smaller fires have been caused by other underground equipment, and it is clearly most desirable that the considerations which I have advanced in relation to the fire hazard at booster fans should be applied equally to all underground equipment which might be capable of causing a fire. I, therefore, recommend every colliery manager to review his pit with the object of identifying every place of unusually high fire risk and of ensuring that there are adequate safeguards against the outbreak and spread of fire at each of these places. Careful consideration should be given to such precautions as the elimination of inflammable material, the proper maintenance of machinery, fire-proofing of roadways and the provision, where appropriate, of automatic protection against heating and of early fire extinguishing. Both the organisation and the equipment for fire-fighting need careful consideration in the course of this review. A situation, as at Auchengeich Colliery, in which fire extinguishers are out of order when needed, or in which there is a delay of an hour or so before water can be applied through hoses to a major fire, cannot be tolerated. It was submitted at the Inquiry that a considerable time might be lost in assembling sufficient trained men to operate a standard fire hose. This aspect of the arrangements should be carefully reviewed. 103. Finally, I think there is a need for some additional means of correlating and keeping under constant review any lessons which are to be learned from the experience of fires, both at home and abroad, with a view to averting accidents from known causes. An equally necessary task is to endeavour to recognise in advance existing hazards hitherto unsuspected and fresh hazards which may come with rapidly-changing mining practice. A great deal of work has always been done and continues to be done on these lines but there is too great a tendency to look at each accident and each precautionary measure in isolation. 104. Following a sequence of explosions in 1956-57, the Safety and Health Committee of the Coal Industry National Consultative Council set up a Sub-Committee on Mining Explosions which produced a most valuable report drawing attention to common features in a number of explosions which have occurred in recent years in this country. Some of these features have been brought to notice again by events since the report of the Sub-Committee was issued. I recommend that there should be a small and active standing committee of experts from the Industry and the Ministry of Power charged with the duty of keeping under constant review the potentialities of disaster from main causes such as fire and explosion. 105. (1) The fire originated in the balata transmission belt of the electrically driven booster fan in the return airway from No. 2 Pit workings. The fire was caused by frictional heat generated between the rotating motor pulley and the belt, which had left the fan pulley and jammed near it. Flame from the belt ignited oil vaporised from the fan shaft bearings and oily deposits in and around the fan. The flame then spread downwind to ignite roadway timbers. (2) By tragic coincidence, forty-eight men riding through the return airway were overtaken by smoke containing carbon monoxide and forty-seven of these men were asphyxiated. (3) The fire would not have reached disastrous proportions had inflammable material been excluded from a substantial length of roadway immediately adjacent to and on the return side of the fan. (4) The haze which preceded the smoke was not recognised, either by officials or by workmen, as a sign of imminent danger. By the time the fire was found the second man-riding train had already left the pit bottom. (5) Fire-fighting arrangements were inadequate but the deficiencies did not contribute to the loss of life. (6) The fire would probably have been averted had the fan been under continuous supervision. It might have been averted or its development halted had the fan been inspected at the half-hourly intervals prescribed as a maximum by Regulation. (7) Closer examination of belt performance after speeding up the fan might well have indicated the advisability of reverting to the previous speed or altering the drive. (8) The unsatisfactory performance of the belt. And the damage done to it in the two days before the fire, particularly the night immediately before, received insufficient attention. (9) By calculation, a balata transmission belt made of 33 ½ oz. cotton duck put on after the speed-up of the fan had an excess capacity of about 50 per cent. and the 31 oz. belt which caught fire about 25 per cent. But the first of these belts lasted less than ten weeks and the other only two days. (10) The belt which caught fire was not of the 33 ½ oz. weight ordered by the National Coal Board and failed to satisfy completely some of the tests prescribed by British Standard 2066. 106. (1) Underground booster fans driven by inflammable belts should be constantly attended by competent and properly instructed persons. (2) The bearings of underground fans should be lubricated with grease or any suitable non-inflammable lubricant that may be developed. (3) All power transmission belts used at collieries should be made of fire resistant material. Pending the introduction of fire resistant flat belting, managers should make effective arrangements to ensure that any over-heating or fire in machinery, driven by an inflammable belt, will be discovered and dealt with before serious danger can develop. (4) All managers should carry out thorough reviews of their fire-fighting arrangements to ensure that sufficient appliances in proper working order will be available for prompt use in any place where fire may break out underground. These reviews should include consideration of telephone systems and means of warning men of fire. (5) All managers should have thorough examinations made of the whole of their pits to identify any places of unusually high fire risk and determine what can be done to minimise the risk at each of these places and to deal with any fire which may occur. (6) The attention of all officials should be drawn specifically to their obligation under Regulation 11 (1) of the Coal and Other Mines (Fire and Rescue) Regulations, 1956, that men must be withdrawn as soon as there is any indication that fire has, or may have, broken out below ground. (7) The industry should reconsider its decision to discontinue the trials of self-rescuers. (8) There should be a suitably constituted standing committee of experts, representing all sides of the Industry and the Ministry of Power, charged with the task of keeping under close and constant review the prevention of explosions and fires in mines, with particular reference to the lessons of actual fires and explosions in this country and abroad, and of anticipating any possible ignition hazards arising or likely to arise from new developments in mining practice. 107. I wish to place on record my sincere thanks to the representatives of the parties appearing at the Inquiry for their help in bringing out the facts .relating to the accident and to express my appreciation of the way in which the many witnesses so ably and frankly gave their evidence. I also wish to express my thanks to the Glasgow Court House Commissioners for the use of the Justiciary Court for the Inquiry, and to the surveying staff of the National Coal Board for the excellent plans they produced and displayed at the Inquiry. My thanks are also due to the Director of the Safety in Mines Research Establishment and members of his staff for the exhaustive investigations carried out at the Establishment, and to colleagues in the Ministry for invaluable help in the preparation of this Report.